We hold expertise in manufacturing and supplying wide range of Central Hole Basin Mixer that are available in stylish designs and patterns. Our products are designed keeping in mind the diverse requirements of the clients. Our product range is easy to install and is the perfect blend of aesthetic designs and elegant styles. These products are extensively used in offices, homes, hospitals, hotels, corporate houses and restaurants. Our entire product range is in compliance with as per international quality standards. 2012-13 Rs. 2-5 Crore Approx. 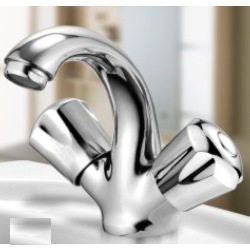 Established in 2004, we Splash Bath Appliances Inc., are the leading manufacturer, supplier and exporter of Bathroom Fittings and accessories. All our products are marketed under the brand name 'Sangam', which is the bench mark for quality of all our products. We design and manufacture all our products as per international quality norms, using high grade raw material, which is sourced from the reliable and certified vendors of the market. All our products are widely appreciated by the customers due to their corrosion resistance, dimensional accuracy, wall our products are widely appreciated by the customers due to their corrosion resistance, dimensional accuracy, wear & tear resistance and longer functional life. For making these products, we have developed an in-house manufacturing facility, which assists us in fabricating all our products as per customers needs and demands. In addition to this, our team of expert professionals works in close coordination with the customers to understand their ever growing demands in a better way. It further helps us in exporting 20-40% of total products across Indian Subcontinent to fulfill the needs of international customers. We export our products in Africa, Australia, U.S.A also tear resistance and longer functional life. For making these products, we have developed an in-house manufacturing facility, which assists us in fabricating all our products as per customers needs and demands. In addition to this, our team of expert professionals works in close coordination with the customers to understand their ever growing demands in a better way. It further helps us in exporting 20-40% of total products across Indian Subcontinent to fulfill the needs of international customers. We export our products in Africa, Australia, U.S.A also.